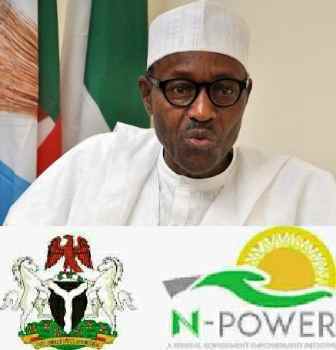 N-Power Volunteers Planning Obtaining Presidential Nomination Form For President Muhammodu Buhari. The aspirants said the cost price as proposed by members of the APC National Working Committee was a deliberate attempt to rubbish the President Muhammdu Buhari government. It was gathered that the party had during the week proposed N1m for State Assembly, N3. 3m for House of Representatives, N85 for Senate, N22.5m for governorship and N55.5m for presidential nomination forms restrictively. 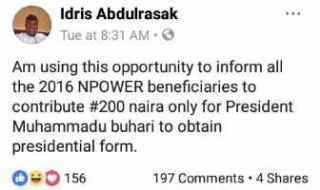 However, the N-power volunteers thinks they can help the president secure the nomination fee and they are considering taxing them selves to raise the fund in order to buy the form for him. Below is a screenshot of suggestion made by a volunteer on Facebook. Remember the N-power volunteers are campaigning for permanency and thinks that doing this can boast their permanency advocacy agenda.